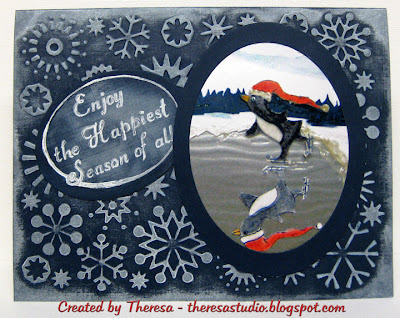 Theresa's Studio: Skating By in Snowflakes. Every week I say I am going to do TMITA challenge early rather than waiting til the last minute but here I am again close to the deadline on Sunday night. This week, the challenge at There's Magic In the Air from Pat P was to make a Christmas card and to include some snowflakes! I had wanted to use acetate and cut out snowflakes on my card but ended doing this card instead. I used one of my fave images from Paper Cupcakes "Flying By"...a skating penguin. The image was printed with a reflection and colored in pencils and OMS. I added some glossy accents, stickles, and used a silver pen on the skates. I attached the images to a background scene that I printed on Printshop and cut into an oval shape. Used a Cuttlebug EF Snowflakes on my navy base card and wiped it with Brilliance Ink Moonlight White to highlight the design. Cut a oval frame for the image and attached to the card. Finished by stamping Sentiment from Creative Clear Stamps with the same ink Moonlight White onto an smaller oval of navy CS. Will talk more when I am not in a rush. How funny...I used to do the same thing with the challenge there. I don't know what was wrong with me, but I always found myself working on them at the last minute! I love this image!!! Your card is just perfect, Theresa! Hard to believe that just about a year ago, you were working one handed!!! This is just as cute as can be! Super adorable! Love the mirrored image you created! Wow!! This is awesome, Theresa. You are really good in Photoshop. I wish that I could do all that with the program. Need to do a little more studying on the tutorials. So glad you could join us this week at TMITA and the saying is better almost late than never.lol Just glad you skated in tonight. Beautiful card. Theresa, I love this! I love the reflection in the ice and I love the embossed background inked up, just makes everything pop! Such a fun card! Thanks for playing along with our challenge this week over at Paper Cupcakes! I love this image too, Theresa! Great snowflakes! Very cool - no pun intended! Love the reflection! Thanks for playing along with Paper Cupcakes!